In honor of Food Revolution Day 2014, I made Jamie Oliver’s banana bread recipe for friends who came over on a sunny Saturday afternoon! 🙂 It was easy, and a HUGE hit! 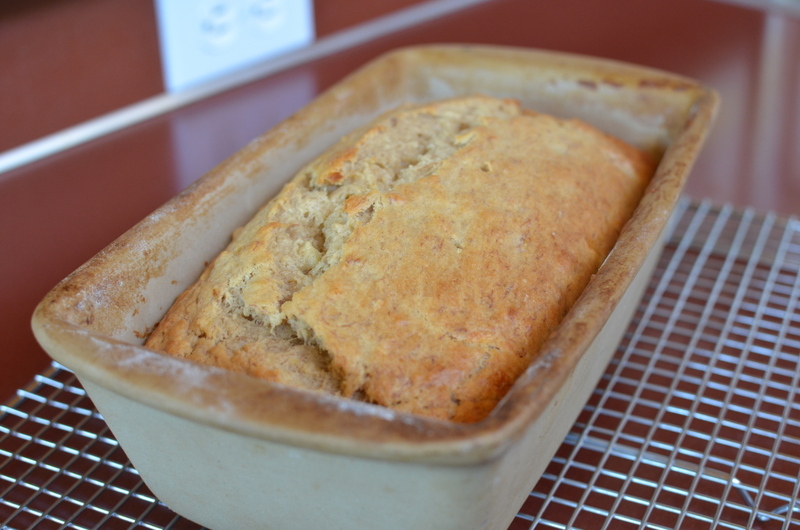 We made Jamie's banana bread for Food Revolution Day, and it was a huge hit! We use honey and the sweet bananas to sweeten this banana bread. Enjoy! Lightly grease the bottom and sides of a 1-litre loaf tin with olive oil. Dust the sides of the tin lightly with flour, then tap to get rid of any excess. Peel and add the bananas to a mixing bowl. Using a fork, mash the bananas so you’ve got a mixture of smooth and chunky, then put aside. Add the apple juice and stir to combine. In a separate bowl, beat the butter with a wooden spoon until creamy. Crack in the eggs one at a time, beating each one in well before you add the next. Fold in the flour, cinnamon, honey and banana mixture, taking care not to over mix. Roughly chop the pecans on a chopping board, if using, then fold through the mixture. Spoon into the loaf tin, then bake in the hot oven for around 40 minutes, or until golden and cooked through. To check if it’s done, stick a cocktail stick or skewer into the middle of the loaf, remove it after 5 seconds and if it comes out clean the loaf’s cooked; if it’s slightly sticky it needs a bit longer. Allow the loaf to cool slightly, then carefully turn out on to a wire rack to cool completely. Transfer to a nice plate, cut into slices, then serve. thanks you so much,amber for this recipe. It’s Jamie Oliver’s recipe! It’s awesome, right? Thanks for visiting! If you go to the Recipes tab at the top of my website and choose “Snacks” you’ll see lots of ideas! I hope some of these look good for your brother, Taylor! Thanks for visiting my website! Hey Amber!I just wanted to comment saying how adorable you are and I’m so glad that a young girl like you can inspire other kids to enjoy healthy eating. My little brother loves banana bread and I’m hoping to bake this recipe with him, so thanks for sharing. Keep up the good work and you’re doing great on Rachel vs. Guy. Hi Destiny! Thank you so much! I really appreciate it. I hope the banana bread is delicious!